Welcome to my EBSQ online gallery. I'm a self taught artist/designer. 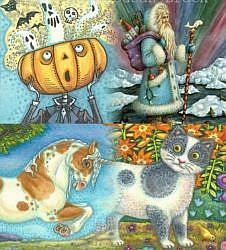 I'm best recognized for my Holiday, Fantasy, Folk Art and Whimsy illustrations. I have a quirky sense of humor. My work has been licensed worldwide and featured in many publications over the years. Most recently, I've been designing for the textile and home decor industries. Dover Publishing is currently offering my illustrations in their CD-Rom Clip Art Books along with several sticker books. If you are interested in purchasing original art, please go to my Ebay and Etsy links. If your company is interested in licensing my work or would like for me to design a collection of products, please contact me through my website www.susanbrack.com or email me at inkpenartc@aol.com Thanks for looking, Susan Brack (Enchanted Sleigh Studios) ........ *Some of the companies that have licensed my work are ... Leisure Arts, The Evergreen Press, Gallerie II, Dover Publishing, Needlepointfriendzi, MBI, Jona Originals, P&B Textiles, Troy Fabrics, Beaded Bear and more. * Magazines, Books, Misc. Publications - Teddy Bear Review Magazine, For The Love Of Cross Stitch, Better Homes And Gardens Santa Claus Collection 3, Dover publications, Doll Reader, The Comprehensive Guide to Chocolate Moulds, Country Woman, Leisure Arts Spirit Of Christmas Books and more.